If you’re expecting or a new mom, learn how to stay strong and healthy throughout and after your pregnancy with specialized training! *FREE 14-Day Trial. After 14 days, pay just $2.99 a week, billed $38.87 quarterly in advance to your credit card. No obligations—cancel anytime to avoid future charges by calling our friendly Customer Service. It’s true. But you have to know which exercises you can safely do during pregnancy and which to steer clear of, because now you’re looking out—and working out—for two. Your solution: Active Maternity workouts with Celebrity Trainer and Mother, Autumn Calabrese. No need to schlep to the gym, splurge on expensive prenatal personal trainers, or worry about whether what you’re doing is safe for you and your baby. Autumn Calabrese, mother and celebrity trainer known for her 21 Day Fix® simple fitness and portion-control program, simplifies it all for you. Just press play and she’ll show you exactly what to do, starting from when you’re an expectant mom all the way through your postpartum weight-loss journey. Her Active Maternity workouts focus on gently building the strength you need for carrying your baby all the way through to labor. And she’ll help you safely develop strong abs and a fit cardiovascular system to give you the oomph and stamina you need for the pushing stage. The workouts are customized to each trimester, demonstrate pregnancy-specific modifications you can use during other activities, and show you how to stretch in a comfortable range of movement. So you can continue to experience the feelings of wellness you get from exercise while carrying your little one to term. And they’re superefficient. You can squeeze these short and sweet pregnancy workouts in when you’re low on time—or energy! Special Note From Autumn: Although my workouts were specifically designed for expectant and new mothers with your health and safety in mind, it is important that you consult with your physician to understand just how these exercises may affect you, your health and your baby. Please get permission from your physician before beginning these workouts, especially if you are high risk, had a caesarean section or experience post-partum conditions. Autumn Calabrese is a busy mom, celebrity trainer, best-selling author, and national-level bikini competitor who revolutionized the Beachbody® fitness model with her breakthrough hit 21 Day Fix®, which features a simple approach to healthy weight loss and portion control. 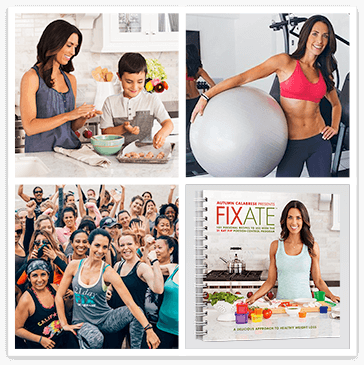 After the huge success of 21 Day Fix, Autumn continued to empower working mothers and her celebrity clients alike with the long-awaited follow-up, 21 Day Fix EXTREME®, and the best-selling portion-control cookbook Fixate®. Autumn was certified by the National Academy of Sports Medicine (NASM) and the American Fitness Professionals & Associates (AFPA). And it doesn’t stop there. This fit mama has been featured in LA Parent, served as the fitness specialist for ModernMom.com, appeared on the cover of Oxygen magazine, was featured in Fitness magazine, Shape magazine, Active.com, Popsugar.com, and has even appeared on TV shows such as Home & Family and Good Day L.A. And now, she’s here to help you reach your goals during and post-pregnancy with her Active Maternity Series. Minimize pregnancy discomfort, prepare for labor, then get your pre-baby body back with Autumn Calabrese's Active Maternity Video Series. These beginning exercises for pregnant women will set a healthy foundation for cardio and muscle development, one of the major keys to reducing discomfort throughout your second and third trimester. Did you know that during the second and third trimester you should avoid standing motionless for too long and exercising while lying on your back? These sets of exercises will safely increase your strength, stability, and overall fitness during this energizing stage of pregnancy. These workouts are designed to keep you motivated and active while preparing your body for a smoother delivery. You’ll practice holding each move for 10 seconds. Each push is about that long, so preparing your body for this type of work is necessary. Ease back into your regular workout routine as you learn the moves that can help you flatten your post-baby belly faster than traditional ab exercises, and start looking and feeling like yourself again. It consists of 2 rounds of 8 exercises you can squeeze in when your newborn is finally napping. You'll even get exclusive access to new workouts from Autumn, plus over 400 workouts from the Beachbody Library. Autumn is constantly creating new and exclusive workouts, and letting you in on her best advice, exclusively on Beachbody On Demand. When you start your free trial to try Autumn’s Active Maternity Series, you’ll feel like Autumn is right there with you helping you reach your goals.